With Andre Roberson closing quickly, Brook Lopez launches a three, early in the shot clock but with enough space to give it a chance. 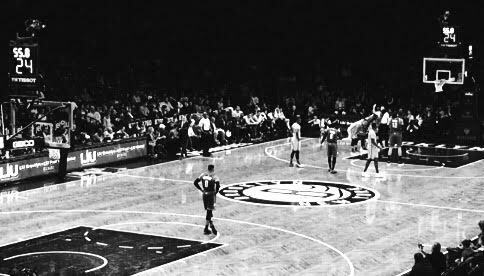 The ball clanks off the front of the rim, kisses the backboard and falls into the left hand of professional basketball’s most perplexing genius, to rapturous applause from what should be a hostile crowd. It is the latter’s tenth rebound of the night, and after adding two more, combined with his 25 points and 19 assists, the intensely focused scientist sits, his team all but guaranteed a victory they would soon officially claim, his 33rd triple-double of the season secure. Thunder doesn’t only happen when it’s raining. It was in the middle of March, in the midst of an overhyped blizzard, that the Brodie came to Brooklyn. Barring a drastic downturn or something otherwise catastrophic, James Harden will be the NBA MVP, emerging from the most crowded field in years, one full of all-time players in the midst of all-time seasons. The extremely simplified cases for and against his three rivals are as follows: LeBron is LeBron, having already won four MVPs and generally being acknowledged as the best basketball player in the world, and possibly ever; Kawhi Leonard is the NBA’s best defender and an increasingly dynamic scorer, albeit one whose defensive excellence actually harms his team, but he benefits from Gregg Popovich and the best organization in sports; Russell Westbrook is volatile, a firework whose fuse is constantly lit, and he sometimes undoes his own fascinating work by overdoing, taking ill-advised shots or catapulting passes into the stands for the sake of assist-hunting. Westbrook leads the NBA in scoring. He’s third in assists and tenth (!) in rebounding. He is likely going to obliterate the league record for usage rate, and if his current assist percentage holds, it would be the third-highest ever. Of course, he is still averaging a triple-double, 67 games in, and it looks increasingly as though he will meet Oscar Robertson at the top of that particular mountain. What really spells doom for his MVP candidacy is the fact that the Thunder are sixth in the Western Conference, and not since 1982 has an MVP come from a team that fell outside the top three in its conference. All of the recent profiles on Westbrook strive to humanize a man who doesn’t seem to want that for himself. Thanks to the likes of The New York Times Magazine and ESPN: The Magazine, we know marginally more about Westbrook’s methodical approach to life than we did before; namely, we have become aware of his pregame rituals, that he is his own accountant and that he used to mop his high school gym floor. We know Westbrook has been an underdog and overlooked nearly his entire life, that the way people choose to perceive him has as much to do with them as it does with him. Russ has been second, even at being second: in 2008, while he, Darren Collison and Kevin Love were busy leading UCLA to a Final Four appearance, one Steph Curry was inspiring awe while dragging Davidson to the Elite Eight. Years later, Kevin Durant made being second his brand via a Sports Illustrated cover story. Speaking of Durant: it was merely coincidence that the opportunity to see Westbrook in person arrived on the eve of the Ides of March. 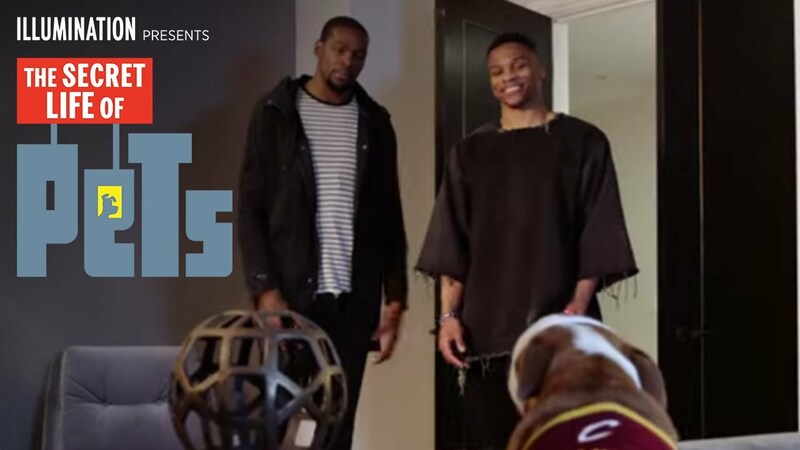 Though he has been loath to confront it directly, Durant’s departure from Oklahoma City over the summer generated more than a lion’s share of takes, reactionary thinkpieces and speculative guesses as to what those he left behind – the man who changes from jeans and a kilt into a 0 jersey night after night, primarily – would do now, after losing a four-time scoring champion in his prime. What could they do? There has never been enough room for Westbrook to grow, so a common argument goes. Hence, the #LETWESTBROOKBEWESTBROOK contingent on Twitter, one which suggests a preference for nature over nurture. Westbrook advocacy has always implied that, given the luxuries afforded other star players and space in which to breathe, the point guard could reach his seemingly limitless potential. As a basketball player, Russell Westbrook embodies a quote-tweet #wellactually reply to John Donne. Of course, this popular portrayal of Westbrook-as-isolated landmass minimizes the impact of his teammates, who, while not the gloriously-constructed squad you might look to assemble in a fantasy draft (read: not Kevin Durant), are capable NBA players. Until the trade for Taj Gibson, of the Thunder’s regular starting five, Westbrook was the oldest, and nobody on the Thunder roster, aside from Gibson and Nick Collison, is 30 or older. There is upside to be had in a post-Durant Oklahoma City. The little things his teammates do that allow Westbrook to do what he does become slightly more apparent in person. There is Steven Adams, boxing out to make a lane for Russ to grab a rebound. There is Alex Abrines, getting a bad look and dishing back to Westbrook to reset the play. There is Taj Gibson, backing away from a rebound opportunity and then admitting as much after the game. Each time, no matter what, there is Westbrook, popping up across the floor from where you left him. It’s cliché at this point, because everything is, but you don’t really grasp how quick Russ is until you see him move with your own eyes. He steps inside the three-point arc, only to pop back out and fire a pass to the corner. By the time that pass arrives, he has flown down the lane and is turning the corner behind a screen to receive another pass, turn and shoot a baseline jumper. The man is a blur who would make Graham Coxon proud. Also harming his MVP case is the fact that he experiences prolonged lapses in focus on defense, which is a fair point; he ball-watches and gets lost amid a sea of screens and switches more frequently than, at least, LeBron and Kawhi do. But, as is the case with Harden, that aspect tends to get blown out of proportion, and unlike Harden, Westbrook is always a willing, if not necessarily completely capable, defender. That becomes apparent when he loses his man, drawn to the ball or otherwise, only to look up, eye his distance from the opponent and, in a solitary motion, lash across the court to get back on the guy’s hip. He tries. Oh, LORD, he tries. Watching Russell Westbrook in person does the totality of his experience a certain kind of justice which television and highlights simply cannot replicate. Even the highest definition, five-digit megapixel viewing devices could not fully capture his hand speed, his eyes darting from one corner to the other, one hand on the ball, the other directing traffic. His first trip to the free throw line resulted in “M-V-P” chants coming from ostensible Nets fans. By the end of the first quarter alone, the Brodie had nine points and eight assists. His triple-doubles, then, are almost incidental, symptomatic of the very singular style he has adopted as his own. It’s as if he can’t help but absolutely dominate a game and doesn’t totally realize it when he does. The mantra that he repeats, “Why not?,” has become a brand, a hashtag and a shorthand for jumping completely into anything, whether it be a one-on-five fastbreak, behind the wheel of a franchise he’s co-piloted for years or potato sack chic. Due to his, shall we say, brevity with the media, Russ has also adopted “I don’t care” into his lexicon of rotating answers, if he says anything at all: I don’t care about Kevin Durant leaving; I don’t care about being MVP; I don’t care about triple-doubles (neither, it seems, does Oscar Robertson, appropriately enough); I don’t care about anything other than winning, and it’s your fault for not caring as much about that as I do. The latter may be the truest. If the rest is true, then Westbrook has taken not caring to atmospheric, unheard-of heights. We know he cares; you can see it just by watching him play, and you certainly don’t need to be in the arena to feel that. Who else would he run himself ragged during a purposefully high-scoring exhibition to win All-Star Game MVP in back-to-back years? Watching an arena let out a collective sigh of relief at the sight of a rebound, however, giving a visiting player a standing ovation and acknowledging that he has fulfilled their impossibly high expectations, the same ones he sets for himself, adds to the distinctly Colosseum-esque feel. Russ has impaled the lion, yet again, and will live to fight another day. Kids having been taken to their first NBA game to see an artist at work on his masterpiece – that is why people love Russell Westbrook. 42.1%; the record belongs to none other than Kobe Bryant, who posted 38.7% in 2005-’06. Russ is already on his way to breaking Michael Jordan’s all-time record for career usage rate as well. John Stockton currently holds the top three slots as well as five of the top six; Westbrook is at 56.5% as of this writing. That, combined with the aforementioned 42.1%, amounts to Russell Westbrook being responsible for 98.6% of Oklahoma City’s possessions while he is on the floor. And they say he has a hot temper! Peanut butter and strawberry jelly sandwich, for which he has his own recipe, followed by calling his parents, going to chapel and organizing layup lines with exactly 6:17 left before game time. “Let he who lives in a glass house,” etc. There’s nothing really wrong with any of this, by the way, so long as it doesn’t materially affect the outcome of the game itself; just as away scorers may not award assists for plays that home scorers might, variability in individual plays tends to run together over a large enough sample size, revealing the greater picture. It’s not like Westbrook’s teammates are clearing the lane for Ricky Davis to rebound his own misses every other night. Proposal for a new Westbrook nickname, courtesy of my oldest, not older, brother: The Monolith. This seems like the place to note that Harden and Westbrook share criticisms for their turnovers as well, although that is drastically overblown, given how each commands his team’s offense; just for the record, however, as of this writing Harden’s turnover percentage is 19.7%, while Westbrook’s is 15.6%.